A wild rumor made its rounds on internet today insisting that Activision wants to buy-out rival publisher Take Two. Following close on the heels of the demise of the Guitar Hero franchise and the cancellation of the (supposedly) nearly complete True Crime: Hong Kong, reports have surfaced of Activision sizing publisher Take Two up for purchase. As evidence, many have been citing the fact that Activision appears to be clearing house to make way for Take Two's competing IP's, and that Take Two's board has been reworked by a well-known corporate raider to be amenable to purchase. So far, there have been no official statements from either Activision or Take Two, but that doesn't mean the rumor mill isn't turning. "There are very strong rumors amongst people at a very senior level within the global business," says a corporate insider. "But they're not much more than that at the moment - they are just rumors. And, of course, given Activision's news this week, everyone is now looking to see what their next move is. But you can definitely put two and two together and make four-ish." Who wouldn't want to purchase Take Two? The company is reporting a 7 percent increase in profits since last year; owns the rights to several killer IP's such as Grand Theft Auto, Bioshock, and the whole 2K Sports brand; and has several wildly popular and successful subsidiaries like Rockstar and Irrational. Of course, the last time someone tried to purchase Take Two, the whole attempt fell apart. 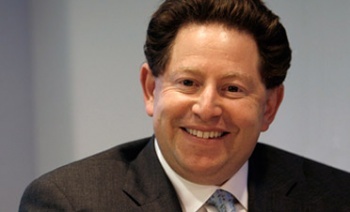 Ironically, Activision's CEO, Bobby Kotick, expressed concerns over a takeover of Take Two back when EA was the one trying to buy it out. And though EA's buyout may have failed, things have changed since 2008. A member of Take Two's board of directors, Carl Icahn, appears to be grooming Take Two for a takeover, forcing three other board members to resign early last year and increasing his share in the company. Some pundits claim that the dropping of True Crime: Hong Kong, a free-roaming crime game, is a sign of Activision clearing the way for a buyout by ditching a game that would compete with GTA. That's an IP every game publisher would love to own, and it doesn't seem like Activiison is afraid to break a few kneecaps to make it happen.